The San Andreas is a transform fault running the length of California. The western side is presently creeping north, relative to the east. Most transform faults lie in the ocean and connect segments of a spreading seam. Rocks on opposite sides of a transform fault are dissimilar because the sides slip past each other. For example, the San Andreas cuts beneath Bodega head, a coastal promontory north of San Francisco. The rocks on the western side are crystalline-diorite, a cousin of granite. The eastern side is made of layered marine sandstones. Where did western California come from? When analyzing natural history, we should (1) first identify our assumptions, starting with the most elementary. Faulty assumptions, when mixed with evidence, taint the data, the methods and the conclusions. (2) Next, we should examine the broad picture before focusing on the local minutia. (3) Perhaps then we can propose limited natural history statements, limited by the assumptions identified in step one and the broad picture seen in step two. Modern geologists begin their theories with the scientific premise. What premise? Scientists presume that the properties of matter are fixed. Yet billions of ancient galaxies shine with different spectra than modern atoms. In general, the spectral differences increase with distance. Scientific earth history stories presume that atoms are immutable and dither with perpetual motion. Since that assumption is the basis of most scientific measuring units and constants, we should carefully distinguish visible evidence from mere mathematical symbols or empirical claims . First let’s examine the broad environment surrounding the San Andreas. The Pacific is the largest ocean, surrounded on three sides by the Ring of Fire, the most active earthquake region on our planet. The ring includes 75% of land volcanoes, active and dormant. The ring passes from New Zealand along a series of volcanic islands that parallel the coast of Asia. It then runs along the Aleutians; then south down the west coast of North and South America, essentially surrounding the Pacific plate. A plate is an area of the crust that acts in a somewhat rigid manner. The first map (at the head of this essay) shows the relative sea floor in the western Pacific. The youngest sea floor is bright red and the oldest is dark blue. Scientist test the basalt crystals on the sea floor for the ratio of daughter atoms to their radioactive parents. They use their assumption that all atoms are not changing themselves, to calculate specific ages. If their assumption is false, the data would support the sequence of how the Pacific formed. We could not, however, speculate on the dates. The oldest part of the Pacific is east of the Philippines, the bright blue ares. At first, the Pacific was located in a small triangular area. The Empire sea mounts parallel the initial spreading of this ancient sea and later cut to the southeast ending in the island of Hawaii. The map shows deep narrow trenches as dark stripes. The Aleutian trench has magnetic stripes that dip down into the trench – instead of running parallel to it. This suggests that the trench is a longitudinal stretch feature. If it were a subduction zone, we should find scraped off sea mounts, piled up sea oozes, scarps and volcanic vents in the trenches. The Philippine trench has very thin undisturbed sediments. Some trenches, such as the Arcadia off the coast of Oregon are filled with thick layered sediments. However, the sediments came from the land, carried out to sea by huge floods that periodically swept to the sea when huge ice dams broke to the East. Evidently the trenches are not subduction zones. This sea-floor map shows the area off California. 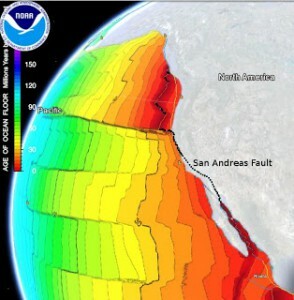 The northern end of the San Andreas continues as a transform (sideways moving) fault as it moves out to sea. Notice that the rocks to the south of this side-slipping fault are older than the rocks to the north. 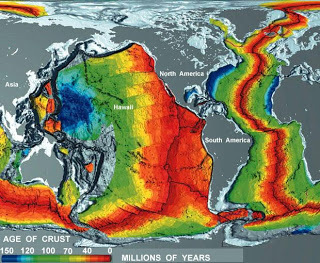 This is doubtless because the fault to the north (the Juan de Fuca ridge) is spreading apart, forming brand new oceanic crust. Deep submersibles find hot springs and fresh lava flows abounding along the Juan de Fuca ridge. The Mendocino Fracture zone also extends for thousands of kilometers west toward to the older sea floor. Every few latitude degrees, parallel transform faults run out into the western Pacific. Notice that both ends of the San Andreas connect to relatively young seafloor, compared to the older ocean floor to the west. How should we interpret this evidence? We should first establish what assumptions we will use. The Bible states that the whole creation is enslaved to change (Greek phthora). We observe the continuum of galactic history optically. We observe that billions of galaxies grew from tiny naked globs to great, local, dusty growth spirals. Visibly, the spectral, volumetric and inertial properties of matter keep on changing. Therefore, we should interpret the evidence with the assumption that the properties of matter are emerging, relationally changing. This assumption is supported at the broadest Earth scale. The continents only fit together on a tiny planet. What could cause earth to grow? Atoms are not immutable. They change relationally throughout cosmic history. What limited statement about the San Andreas can we propose from the evidence and our simple assumption. (1) It is a relatively young feature, compared to the Western Pacific. (2) Where did the crystalline-diorite come from on western Bodega head? We find similar diorite along the coast of British Columbia and Alaska. (3) Could California, west of the San Andreas, have once been an island that moved south as the Pacific floor expanded south and east? Please notice that Australia and Antarctica are today south of their original positions, since the relative ages of the Pacific floor show how the Pacific grew and continues to grow to this day. (4) Apparently the San Andreas was once disconnected from the mainland, as Baja California is presently disconnected from Mexico. Around Bakersfield, tens of thousands of whale and shark bones lie close to the surface. Drill cores below these fossils beds show layers of marine oozes. Evidently ancient whales and their predators gathered in an ancient sea between the two sides of the San Andreas, as they do today in the Baja California sea. How long did it take for the Pacific to grow to its present state? We cannot speculate because every atomic clock in the visible universe accelerates its frequencies. The fastest, normally energized, atomic clocks are local. We also see how star-streams concurrently accelerated as billions of galaxies grew. All we can say is that the simple evidence supports our assumption that the properties of all matter emerge, change relationally throughout cosmic history. When the properties of atoms change, it radically affects the surface of our planet.